I loved my DIY floral arrangements (bouquet, corsages, boutonnières, and centerpieces)–but I will be the first to tell you that this DIY project is NOT for the faint at heart. It takes a lot of work and planning, but it is by no means impossible! Since we were having a spring wedding reception, I decided on yellow and green for the wedding colors. In fact, the first flower that came to mind were daffodils–to me, nothing symbolizes spring better than these cheerful blooms. Unfortunately, I discovered that daffodils are an EARLY spring flower…and that they are generally only available through April. One seller told me they might have some through early April, but it wasn’t a realistic option for a May 17 reception. I struggled to think of another flower. Of course, roses are always a safe bet in terms of their visual appeal, but I knew I didn’t want to deal with bulk roses. As a student government member in college, I remember making Valentine Flower Grams for dorm residents. We bought the roses in bulk at the flower market, and had to strip the roses of their thorns ourselves. This is a painstaking task (even with the proper tools!) that I would NOT recommend to a DIY bride just before her wedding. There are between 3-5 blooms per stem, so it is a low cost, yet high impact, flower. Back in 2009, I was able to purchase 200 stems for only $140! 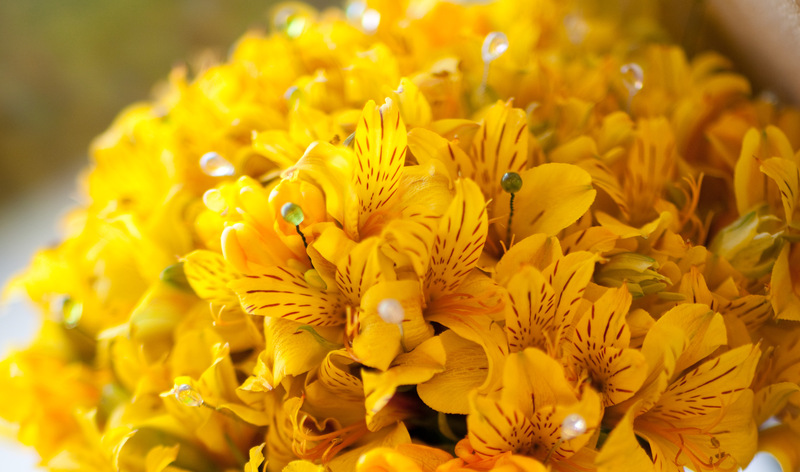 Alstroemeria comes in a variety of base colors, and most of them have streaks of contrasting colors. This gives alstroemeria a lot of visual interest, and they stand out quite well even without any companion flowers. These are long-lasting hardy flowers once you remove the lower leaves (which bruise easily). You can expect your alstroemeria to last between 1-2 weeks. Order Your Flowers Online: Since I had the added challenge of planning my wedding from overseas, ordering my flowers online was a natural choice. By ordering them online, I also saved a lot of money. Just remember, though, that part of the savings is from not paying for someone else’s labor. You (and ideally your friends and family!) will be providing that labor instead, so don’t forget that you need to make a significant time investment. Keep It Simple: This is especially important if you are doing a lot of other DIY projects, like I was. If you want something more elaborate with your flower arrangements, then you really shouldn’t have a lot of other projects going on. The easiest way to simplify your wedding flowers is to select ONE flower. Since this flower will be featured in your centerpieces, bouquet, and bouts/corsages, pick something with a lot of visual interest on its own. I’ll repeat again that I think alstroemeria is a great flower precisely because of its multi-colored appearance! Do a Test Run: If you buy your flowers online in bulk, you are generally going to receive them the way florists do: buds still closed, stems still tall, and no leaves or greenery removed. It is imperative that you do a test run so you can see for yourself how long it takes them to open and look their best. Then you can figure out how much earlier than the wedding the flowers need to be delivered. Based on my test run, I wanted to use my flowers on the 4th day after delivery. Also, it gives you a chance to experience the work involved in doing your own flowers, and if it’s too overwhelming, you’ll have time to find a florist. You’ll also get a sense of your vendor’s delivery service and flower quality. I can’t imagine why brides would skip this step and just try to wing it days before the big day, and then panic when things don’t work out, but I’m always coming across horror stories of brides who do just that. There’s no need to set yourself up for panic. DO A TEST RUN! Prepare for Delivery Day: Remember, you are ordering a live product. Clear your schedule and be home on the expected delivery day so you can take care of your flowers. Don’t let them languish in their delivery box, and even worse, on your front porch, on a sunny day! Immediately check the flowers to see if your order is correct, and if not, contact the vendor immediately. Then move them to your storage area (somewhere cool). I stored my flowers in large buckets in the guest bathroom. With these tips, your flowers will bloom and be ready for your various DIY projects! The next few posts will cover DIY corsages/boutonnières, centerpieces and the wedding bouquet.